In an update on the measles outbreak in Rockland County, New York, health officials are now reporting 68 confirmed cases as of Tuesday. 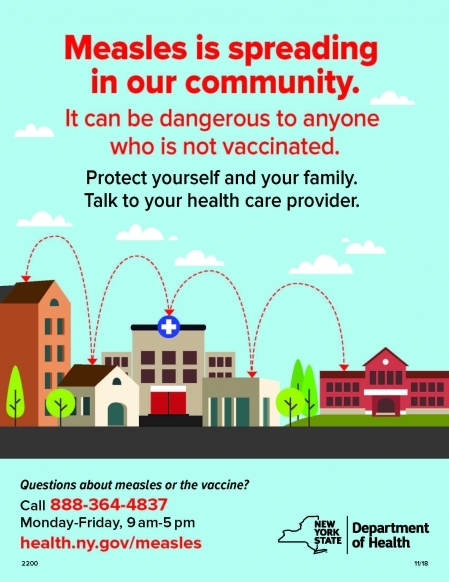 These cases are presently clustered in eastern Ramapo (New Square, Spring Valley, Monsey), however due to Rockland County’s small geographic size, exposure to the measles may occur anywhere in the county. To date, the Rockland County Department of Health (RCDOH), Refuah Health Center, and private pediatricians and family doctors have administered over 6,100 doses of MMR vaccine.